At StanceWorks, we try to share a little bit of everything. From modern to classic, and subdued in nature to over-the-top: if it excites us, it earns a place on the StaceWorks homepage, and that’s how it’s always been. However, it’s hard to suggest that it’s anything compares to the excitement, the history, and the character of vintage motorsports… in our opinion, at least. For years, we’ve sat trackside, capturing the classic legends as they battle it out for glory and pride, and more recently, we’ve began to participate in a bit of racing of our own. 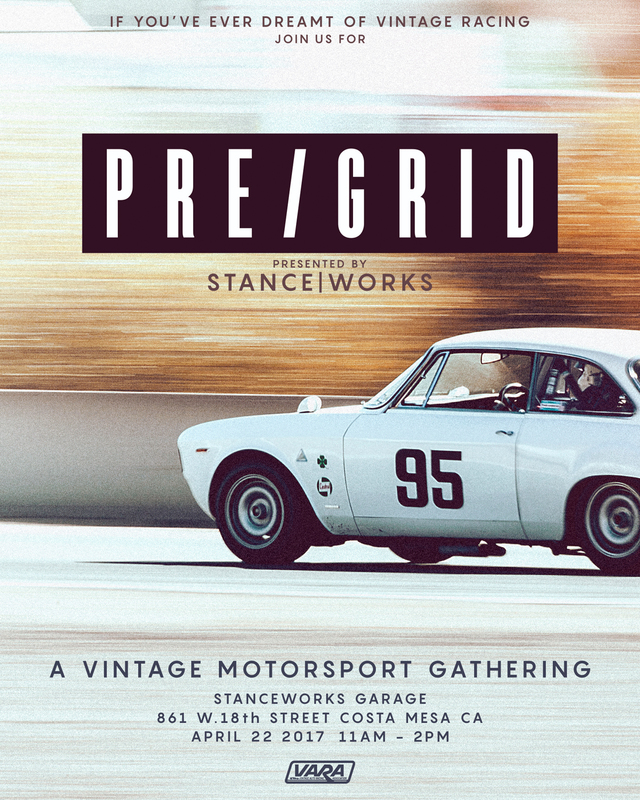 In April, we’re hoping to share that passion, and so we invite you to join us at the StanceWorks HQ for Pre/Grid. We’ve joined with VARA - the Vintage Auto Racing Association - to host Pre/Grid, an all-inclusive event in an effort to celebrate vintage motorsports, and more importantly, to welcome and usher in a new generation of classic racers. For those that have dreamt of racing their classics, or for those with merely an interest - or even those without, that simply want to admire some classic race cars - join us on April 22nd. Heard about this for the first time on The Smoking Tire podcast! Wish I had known sooner or seen it on some of the local car FB groups! Free steam wallet codes it is so good http://stmkeyscodes.net responsive for the great site.